Spend enough time in Chicago and you will inevitably hear someone mention that the Windy City has two seasons: Winter and Construction. I'd like to point out a third season, that starts sometime around the last week of February and lasts through March 17th. There's a run on corned beef at the grocery stores, beer and the Chicago River turn green, and people wear the most ridiculous things just so they, too, can wear green. Chicago is B-I-G on St. Patrick's Day. Go figure. There's another, more exciting green that appears about this time of year. Asparagus pops up everywhere, and it's on sale for an incredibly low price. I don't know if it's local, and I'm sure it's not organic, but it's fresh, and cheap and I always end up buying as much of it as I can and eating it until I can't stand to eat any more. Which is fine because, by then, it is no longer fresh and the price has gone up. I don't know if there's a direct connection between asparagus and St. Paddy, but they will always be interlocked in my mind because asparagus is green and it always shows up right right before March 17th. Which is more than fine with me. And if I'm particularly lucky, Texas ruby reds will also be available, and I can make this delicious Roasted Asparagus and Grapefruit salad. It's another one of those bridge dishes that starts to whisper sweet nothings of springtime in my mouth. Trim the bottom ends from the asparagus and rinse under cold water. Toss with the olive oil and salt and pepper to taste. Place on a shallow baking sheet and roast until tender, 15 to 20 minutes. In the meantime, heat the grapeseed oil in a small skillet. Add the shallots and saute, stirring frequently, until they are well browned, but not burned. Remove from the skillet and place on a paper-towel covered plate so they will drain and get crispy. 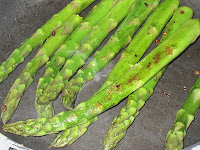 When the asparagus is tender, remove from the oven and divide them by four. Arrange each fourth on a salad plate in a single row and cover with the cheese while they are still warm. 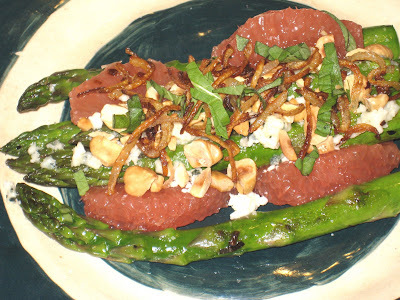 Divide the grapefruit in fourths, and arrange each fourth on top of the asparagus and cheese, and then top each dish with the basil, nuts and shallots.